Companies operating in the B2B space are quickly adopting ecommerce. The past few years saw the emergence of major players in B2B ecommerce segment. However, according to MarketingLand, only 11% of the B2B is on ecommerce in 2016. This indicates a clear growth path for B2B ecommerce and the ecommerce players are about to witness a substantial and sustainable growth. A new or a growing B2B ecommerce players needs to gear up for the growth to leverage on this opportunity. This blog talks about the challenges of B2B companies in emulating the offline experience online and how ERP ecommerce integration, along with a few other connectors, can help. Connected ecosystem bridges the gap to allow seamless flow of information. However, mere interconnection of multiple systems will not be sufficient. Each ecommerce player has specific requirements and need custom solutions. Below are some such modules and their role in the B2B ecommerce business, which enhance the functionality of the eco-system. B2B organizations operate in complex environments, deals with large number of suppliers and distributors. They mostly follow a typical flow – request for proposal, go in for negotiation, quotations are made accordingly and send to the requester, closes with the requester accepting the proposal. Once the deal is closed, the transaction occurs. Magento 2 offers some of these features. However, most players need better flexibility to address their needs. i95Dev Magento B2B extension Advanced Quote Module expands the stock features by adding full quotation process and giving your business the necessary edge to accomplish business objectives. B2B customer is more often a returning customer who knows exactly what he needs. All they look for is the ease in searching products, and importantly selecting bulk products at one go when they buy those items regularly. Even Magento 2 falls short in this feature to support necessary flexibility. Lack of this feature (and ability to customize) forces bulk buyers to search or browse products one by one, which affects the customer experience. 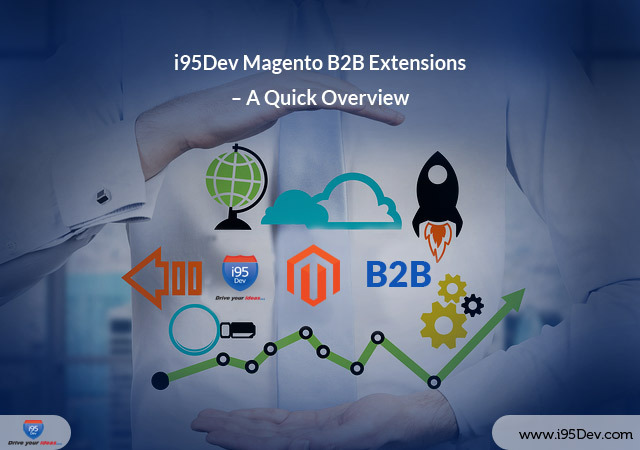 i95Dev Magento B2B extension ‘Quick Order Module’ helps your business facilitate customers to purchase products just with complete or part SKU numbers and designate quantity for purchase. This makes the journey of repeat buyers easy, as they no longer have to perform the repetitive time taking a task to order in bulk online. One key challenge a B2B salesperson faces is his information management of his leads and clients. If the information is not available readily to him, he ends up spending time sifting through information and his productivity takes a hit. Our Magento B2B extension ‘SalesPerson module’ allows assigning a specific salesperson to each customer or group of customers to provide the best customer service. Sales reps can easily access transaction history, order status, custom pricing levels and billing and shipping information, as well as place orders for customers. Terms of payment play an important aspect in closing the account. B2B store often fail in providing the details of net terms and this lack of information is a key challenge. A B2B ecommerce store must make sure that the information is available on the store payment window. This Magento B2B extension ‘Net Terms Module’ helps your customers choose a suitable payment terms and pay their pending invoices from the convenience of the Magento e-commerce store. This information is synced back to ERP to make sure your account books are up-to-date. A B2B company tends to a variety of companies that have different credit limits and terms. When B2B e-commerce companies leverage on the ERP Magento integration, the online transactions must be in sync with the ERP structure. Our ‘National Accounts module’ allows B2B e-commerce players maintain the accounts books intact, while they scale their B2B e-commerce business. It automates various aspects like maintaining parent account details updated in ERP and e-commerce, maintains children information, maintains the pre-defined parent-child hierarchy, generates the parent entity for child entity’s expenditure, etc. Process of payment in B2B is generally complicated compared to a B2C scenario. Aspects like partial payment and single invoicing for parent accounts are important in B2B scenario. The payment options offered are specific to each ecommerce company. However, Magento might be able to address all the specific challenges. i95Dev’s ‘Bill Pay module’ can help B2B ecommerce players bring the much needed flexibility into payment process. Coupled with one of our suite of connectors, this module can take care of all the bill pay needs and credit limits of customers. i95Dev worked with various companies spanning different continents since 2000. We are Magento platinum certified e-commerce solutions providers. Our clientele span across various domains both B2B and B2C. Apart from Magento development, we even provide integration solutions between your Magento store and the most widely used ERP systems (Dynamics AX, GP, NAV, SAGE, SAP B1). If you are an e-commerce operation looking to take the next logical step contacts us at info@i95dev.com.